1. What is Stow Simple? Stow Simple is the easiest way to store your stuff. We pick up, store and return your items with the click of a button. If you like we'll even take pictures of your belongings so you always know what you have stored. 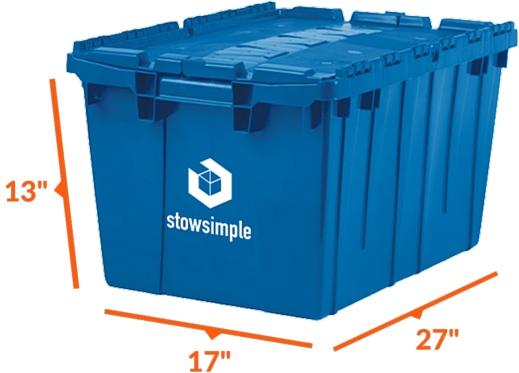 Stow Simple lets you see and access your stuff without ever having to visit a storage facility. 2. How does Stow Simple work? It's soooo easy! You can Store by the bin or store by size. Simply book an appointment online or call us. If you want to pack your things in our easy-to-pack bins, a Stow Away Team Member will drop off durable plastic bins to your door. We'll even wait up to 20 minutes for you to pack. If you need more time, we'll come back at no charge. If you don't need any bins, we'll gladly pick up your boxes and larger items. Your belongings will be stowed in our secure, climate-controlled facility. 3. How safe are my things? We use American made heavy duty, commercial, water resistant bins. You'll love them. 4. Do you offer insurance protection for my items? Yes, we carry insurance against items stowed in our bins to give you peace of mind. Our coverage protects against the unlikely event that items get damaged, stolen, or lost during storage or transportation. Our policy accepts claims of $100/bin (up to $500 per customer). Outside of the protection, if you have renters or homeowners insurance, your personal articles policy should provide coverage for your items while in storage. Please contact your insurance provider for more detailed information. 5. Is your facility climate controlled? Yes! We understand how important your belongings are and just how hot and sticky Florida summers can get. Fear not, our warehouse is fully air conditioned and kept between 55°F and 83°F. We work diligently to help protect your goods from dust, mold, pests and humidity. 6. When do you deliver/pick-up? Whenever it is most convenient for you. Just select any available delivery window. We can be there in as little as 24 hours, or you can schedule up to a month in advance. Our typical delivery hours are Monday through Saturday 8AM - 7PM. However, if those times don't work, give us a call and we will do our best to meet your needs. 7. At what time can I call your office? After our morning cafecito, our customer care agents are up and ready to go! You can reach us from 9AM until 6PM EST, Monday through Friday and 10AM until 4PM on Saturdays. If you're calling outside of our office hours, leave a message or email us at support@stowsimple.com and we will get back to you in a snap! 8. Can I visit your office? Our goal is to make storage super easy so you never have to visit our facility. If you need your stuff in a jiffy, give us a call. We'll do our best to make it happen. 9. Is there an app for that? We don't have an app just yet, but our site is mobile friendly. An app is coming soon! 1. How much does it cost to Stow Simple? Our prices start at $30/month. There are no long-term commitments or price hikes. You can store any combination of items as long as they add up to $30 and are stowed for at least 3 months. Our bin pricing starts at $6. Each bin fits as much as 2 carry-ons (or 3 cubic feet each). If you need to store more, each additional bin is $6/month. If your items are too big for a bin, we'll gladly stow your oversized items. Stow Simple Urbin Closets - If you have a bunch of stuff, don't worry. Our Urbin Closets are like having an on-demand storage unit. Our pricing starts at just $49/mo. Our plans fit small furniture, boxes, bins or your entire apartment. They include a free pickup and complimentary use of our Stow Simple bins. 2. What are the prices for oversized items? If your items don't fit in our Stow Simple bin we can still stow them. Simply sign up for one of our storage units. We offer various plans to meet your needs. We bill your credit card once we have received your stuff at our storage facility. Future charges will occur on the initial anniversary date. For example, if we pick up your things on the 7th of the month, your "second month" begins on the 7th of the next month. (Please note: we have a three-month minimum). If we pick up your things after the 28th of any month, your anniversary date will be on the 28th. 4. Can you help me to better understand the $30, 3-month minimum? We will return your items whenever you want, however we do have a $30, 90-day storage minimum per item. If you remove your items prior to the 90 days you will be charged your original monthly rent for the remaining time. In addition, if the individual items being stowed fall under $30, you will still be charged $30 per month. 5. Can you clarify pickup and delivery pricing for me? While a storage pickup (one person, appointment times vary) is included, deliveries from our warehouse vary in cost depending on your plan. Bin Storage - $25 a trip, but you can order back as as you'd like in that trip. Store by Size - Our Store by Size plans including our 2'x4', 5'x5', 5'x8' and customizable plans. They provide the flexibility of delivering a few of your items, or all your items at once. We cap your delivery cost at the cost of one month’s rent so you know you can affordably have your items returned to your door without lifting a finger. You can have any number of your items returned and we pro-rate that handling fee for the items being returned. The minimum return delivery fee is $25/trip. 6. Why are pickpus fee and deliveries charged? Well, we tried to keep things simple. Instead of charging separate fees for pick up and the return your items, we developed delivery fees to cover our transportation costs. 7. How do I update my billing and contact information? Simply login to your Stow Simple account to make any changes to billing or contact information. 8. What happens if I miss a payment? Life happens and we understand. That's why there is a 9-day grace period for late payments. However, on the 10th day you will incur a $10 fee. You will also incur a $1 per day late fee for every day your account is past due starting on day 11. Hence if your account is 15 days overdue, the fee is $15 dollars. If 20 days past due, the late fee will be $20. If you settle your account before being 10 days delinquint there is no penalty. Please note that after thirty days, we might even have to auction off your belongings and you will be subject to additional lien and auction fees. You may review our Terms of Service for more details. 1. How many bins will I need? If you don't know how many bins you'll need, order a few more. We only charge for the bins you use. As a tip, our average customer uses 8 bins. Our heavy-duty, American made bins have a 50lbs weight capacity. 2. Will you help me pack? As much as we'd love to help out, we aren't allowed to pack bins on your behalf. 3. Can I stow items that don't fit into a bin? Absolutely! Our Stow Away team can pick up most items that one person can carry. Please note heavy/bulky items are subject to a $55 extra person fee to pickup. For a list of prices CLICK HERE. 4. Is there anything I can't store? We are happy you asked. CLICK HERE to see our Storage Rules where we list prohibited items including perishables, liquids, hazardous and illegal materials. 1. When do you deliver/pick-up? 2. What do I need to do before pickup? Just pack your bins and ensure that furniture items are disassembled prior to pick up. We'll pick up your bins and seal them with a uniquely coded seal. Bins shouldn't weigh more than 40lbs. If you can't lift them as high as your chest, well, they are probably too heavy. We provide any moving blankets, shrink-wrap and other equipment or materials necessary to safeguard your items during transport. All of this is included in your monthly storage rent. We do not pack boxes or containers, so you will need to box or protect most non-furniture items. We understand that some oversized items, like lamps, bicycles and other items are too awkward to be boxed, so we can take those as is. We recommend that you safeguard your electronics, picutre frames and vulnerable items. There are a few items we cannot take including items over 200 lbs or 10 feet long. 3. Will you wait while I pack my bins? After dropping off your bins, our drivers will wait for up to 20 minutes while you pack. If you need a bit more time, just schedule a free pick-up anytime within two weeks. 4. How long can I hold onto my bins? Each plastic bin is made of highly durable material and is not cheap, so we ask you to please schedule a pickup within 2 weeks of receiving bins. If you keep empty plastic bins for more than 14 days without booking a pickup with Stow Simple will consider this as a purchase of the plastic bins and you will be charged $28 per bin on the 15th day. 5. Can I change or cancel a pickup or delivery? Yes. You can reschedule your appointment, however cancellations made with less than 48 hours notice are subjec to a $100 cancellation fee. To cancel an appointment, simply log onto your account and select to cancel appointment. You may also call (888) 544-6050 or email support@stowsimple.com. 6. What happens if I'm a "no-show" for my appointment? Our Stow Away Team will wait for 20 minutes while trying to get in touch with you. You'll be considered a no-show after 20 minutes and we'll have to charge you $100. 7. What if I need to cancel after I have received my bins? After we drop off the initial bins, if you decide not to stow with us, just let us know. We'll come pick up the bins. Please note that a $50 "Empty Bin Pickup" fee will be incurred. 8. How long does it take to get my stuff back? In most cases, we can get your bins back to you in 24-48 hours. It's always smart to book as far in advance as possible to ensure your preferred delivery date/time. 9. I moved out of Miami, how do I get my stuff? Please email us at support@stowsimple.com or give us a call at (888) 544-6050 and we'll work with you to ship your stuff to your new location. 10. How long do I have to unpack? Our Stow Away Team will wait 20 minutes for you to unpack. If you need more time, you can hold onto the bins for up to two weeks, but we will have to charge you a $25 fee for the extra trip to recollect the bins. 1. How can I see my stuff online? Go to www.stowsimple.com then choose to login to your account. Once you are logged in, choose Lookbook to see your things. Please remember that it could take a couple of days to upload your items if you have chosen to have overhead photos of your bins. All other items will be identified by stock images. 2. Can I keep a log of my stuff? Yes! We allow you to keep an online packing list. Here's how it works. Once you place an order with Stow Simple you can access your Lookbook. The Lookbook shows all items you have planned to stow or are stowing with us. While in the Lookbook, you can create your packing list of all items being stored in each bin. 3. When will my overhead photos appear in my Lookbook? One of the best parts of Stow Simple is that we keep an online catalog of your stuff. These photos serve as a visual reminder so that you never forget what you have stored. When you want something back, login to your account, view your items, and select exactly what you want returned to you. It may take a few days for us to take and upload your photos, so please be patient. 1. What areas do you service? Our fleet currently services the areas listed below. We are hoping to expand soon. If your ZIP code isn't listed and you want service, please send us an email at support@stowsimple.com.